Deadmau5, aka Joel Thomas Zimmerman, is one of the renowned DJs of the world, having a net worth of $53 million. He is considered as one of the highest paid DJs of the electronic music industry and has been placed on the 5th position in Forbe’s list of “The World’s Highest Paid DJs 2013”. Hakkasan and other night clubs pay him nightly fees of $200,000. Joel also earns a lot of money through massive merchandise licensing deals, his own label Mau5trap, and record music. Besides this, he also commands $100,000 for each show. He is the 4th highly rated DJ in the world. Though Deadmau5 has less experience as compared to other DJs, he has also started to make his roots stronger in this electronic music industry. He has produced several hit albums and singles in a remarkably short period of time. His studio albums include For Lack of a Better Name, Album Title Goes Here, Get Scraped, etc. It Sounds Like, Project 56, and A Little Oblique are some of his other albums. These albums have their CDs available at almost all the music outlets. One other source of his earnings is the sale of T-shirts, having his name printed on them. Joel Thomas owns a beautiful bungalow in his hometown, Toronto. He is also fond of cars and other technological gadgets. He owns a Ferrari 458 Spider, whose pic was recently uploaded on the internet for his fan followings. 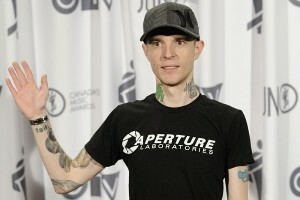 He is also an owner of Porsche 911 Carrera S, which was gifted by his ex-fiancé, Kat Von D.
Though, Deadmau5 is surrounded by controversies, yet, he has a massive fan following. He initiated his career with a demoscene and chiptune movements, in the late 1990s. In 2005, he launched “Get Scraped”, his debut studio album, which was a substantial hit. He started his own record label, named “mau5trap”. After that, the line of hit albums followed one by one and gave a new direction to his career, making him one of the most popular DJs of the world. He has also given appearances in a video game and is a playable avatar in “DJ Hero 2”. For his work, Zimmerman got various nominations and awards. The famous DJ donated the proceedings of the auction of his mouse head to Japan’s Red Cross. In the same auction, Daft Punk also donated a car.